What Causes Finish Checking (Crazing) On Electric Guitars? | What Causes The Finish to Turn White and Cloudy? Does Lacquer Always Turn Yellow? 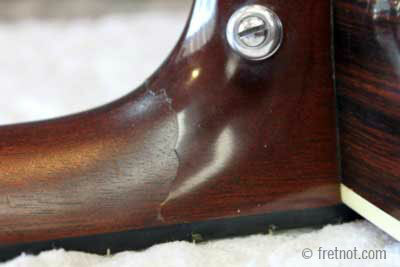 This is an extremely common, somewhat expected condition on older instruments with lacquer finishes. Checking will vary according to the extremes the instrument has been through. 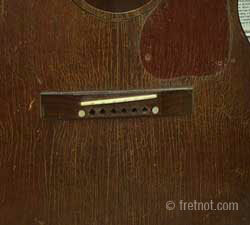 As an instruments wood expands and contracts with moisture content stress is placed on the finish. The lacquer itself is put thru allot of stress as this takes place and the finish may develop checking/crazing is a result of this movement. Checking looks like very fine finish cracks running in all directions. Extreme and sudden temperature changes can also cause finish checking, regardless of the instruments age. If you travel with your instrument and it is subject to severe temperature changes, you should allow it to acclimate to room temperature before opening the case. When instruments are shipped to me they are left unopened until I am sure the contents have had the opportunity to warm/cool to room temperature slowly. You should also insure you are properly humidifying your instruments to avoid sever dryness. See my humidity article for more information. Can you repair finish checks? Because checking is a common occurrence on vintage instruments most should avoid refinishing as it is likely to happen again. An additional deterrent would be the negative effect on value. Instruments finished in nitrocellulose lacquer not only tend to craze with greater ease than the newest catalyzed finishes but they also yellow with age. An instruments finish can consist of a color coat and clear top coat or simply a clear coat. With age this clear top coat begins to turn yellow. That means a white guitar may eventually turn yellow and, since blue and yellow make green, older blue instruments can eventually turn green. This phenomenon is a simple fact of life and a natural occurrence with aging lacquer. While it's true that UV rays may accelerate the process (just peak under a pickguard), nothing can be done to stop nitrocellulose from yellowing. In fact, like crazing, it is a common and expected occurrence. Can you sand off the clear coat to remove the yellowing? As simple as that may sound the answer is no. Trying to sand off just the top clear coat and not damage the color is a lesson in futility. That being said, when I was young I attempted to sand off a refinish color to reveal the original finish on a vintage Fender Strat. What I found after days spent removing small amounts of finish was that the original coat had been sanded thru in areas as it was prepped for the refinish. Futility only a do it yourself er would attempt! Lacquer is the most common finish used on vintage instruments and while it has great properties for touch up it can be damaged with certain solvents. Lacquer is a solvent based finish and can be damaged by contact with acetone and lacquer thinner. It can also be damaged with prolonged contact with water and denatured alcohol. 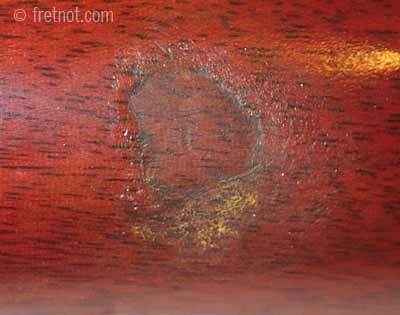 One reaction that many are unaware of is lacquers nasty reaction to prolonged contact with vinyl. Vinyl will soften lacquer to a point that it will roll up under your fingers. Refinishing of the effected area is necessary. Different manufacturers have had issues with de-laminating finish at different times. De-lamination occurs when the top coat can not adhere to the underlying sizing or sealer. Much like the white Dodge's we see driving around with large patches of exposed gray primer, the top coat let's loose and chips off with little effort. Because this is an adhesion issue, overspraying without stripping to bare wood often results in a repeat. The surface must be re-prepared for refinishing. Clouding refers to a milky white coloring that quite literally clouds the finish. I have only witnessed this phenomenon on inexpensive poly finished instruments. Due to the time and cost involved to strip and refinish one of these instruments it is a condition most are forced to live with. Because the clouding is in the finish, buffing and polishing have no effect. This is not usually seen when the instrument is new but develops over time. While I have ideas as to the cause I do not know for certain. Obviously scratches are a part of life, but on occasion we want to spruce up our instrument and erase some of the wear and tear associated with playing. Buffing scratches is an option if they don't go too deep. When buffing scratches out, quite literally, finish is being removed until you are at the bottom of the scratch, making the finish a smooth flat surface again. For heavy scratches, wet sanding often precedes buffing. While this is completely reasonable for very fine scratches, you can quickly guess why attempting to buff out a very deep scratch can end in disaster. On instruments with color, a clear coat sits atop the color coat. If too much clear is removed you may buff into the color coat. Doing so leaves a hazy dull ring around the area of transition. If the instrument is merely clear coated, the same applies, sanding or buffing thru the finish will leave bare wood exposed. Drop filling a scratch, leveling the fill with the surface and then buffing the instrument is another technique. However, when drop filling lacquer and other finishes, the fill normally shrinks with time and a dip is still seen even after a spotless repair. A good rule of thumb here is, if you can hear your fingernail click when running it across the scratch, it is probably too deep to wet sand or buff out. Glazes and waxes attempt to "fill" scratches and claim to make them less noticeable. However, coming from an ex-body shop manager and car detailing buff, it isn't as easy as all that. 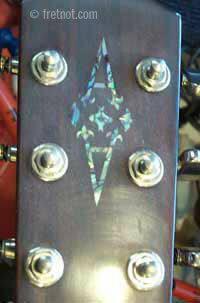 Fret Not offers small touch up and repair but I no longer offer instrument refinishing. After years of use I have developed serious reactions to it, for my own good I have decided to stop spraying finishes.